The new Austria Euro 16 Home Kit has been manufactured by Puma. It introduces a fresh look with a modern design, and was launched on November 9, 2015. The new Puma Euro 2016 Kit is mostly red in colour with a fine gradient graphic on the front. The front side of the shirt has diagonal lines of varying width that gives a good visual effect, whether seen from both close and afar. The fine colour contrast of red and white gives it a fresh and clean feel about the shirt. A bold white border line runs down each sleeve of the new Austria Euro 2016 Home Kit. The front side of the new shirt include the logos of Puma and the Austria football team. 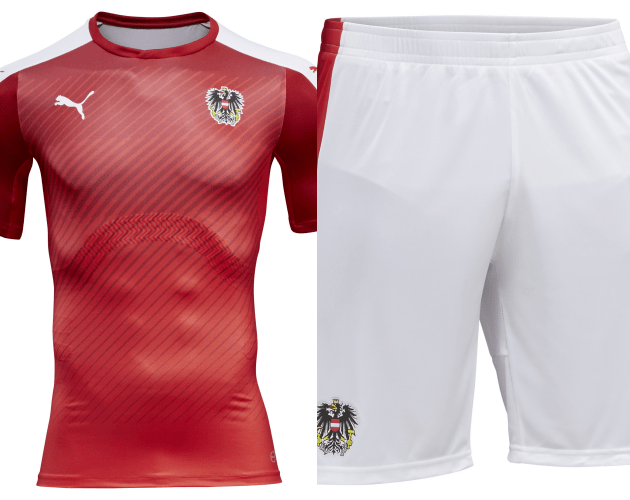 The shorts and socks of the Puma Euro 16 Austria kit are white and red, which has been the Austria’s traditional colour scheme. Do you like the new Austria Euro 16 kit? Let us know on Twitter. And don’t forget to check our comprehensive Euro 2016 kits guide.